Looking to gain a lot of attention, Jordan Brand is set to release two new impressive shoes today and one of them is the new colourway of the Air Jordan 2.0, a shoe that is the new generation edition of the famous Air Jordan II. Hitting the market today is the Black/Classic Green – Varsity Red – White colourway which is also known as the Gucci edition because of the colourway features applied in this shoe. 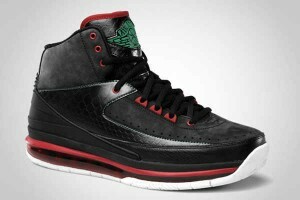 The shoe features a black upper part and tongue with classic green, white, and varsity red accents all throughout the shoe. With its impressive-looking design, expect this to make a lot of noise in the market today and in the upcoming months as well!